Twenty years ago, if someone with dark colored eyes wanted to wear colored contacts, their choices were limited to just a couple of options, like dark green or even darker brown. Thank goodness times have changed! Today’s technology allows colored contacts for dark eyes to achieve the same dramatic effects, even when going for a different eye color altogether. The best option to change dark eye color is opaque lenses, like Freshlook Colorblends which blend three colors to mimic the eye’s natural depth. These contacts have a better chance at changing your eye color. For example, the color variation in Freshlook Colorblends latest shades, Gemstone Green, Brilliant Blue, and Sterling Gray. They offer everything from a hint of enhancement to an intense color change regardless of your natural eye color, even for dark eyes. When it comes to blue colored contacts for brown eyes, we recommend the following three popular shades: Acuvue 2 Colors Deep Blue, Triple Color Blue from Turtle Contacts. Note: both Triple Color Blue and Aquatic Allure have a dark outer ring which tends to make the eye color stand out (ideal for Paris Hilton look-alike aqua blue eyes). Grey contacts are not always visible over dark brown eyes. Good idea to experiment with different brands or shades to find the one that gets the effect you want. 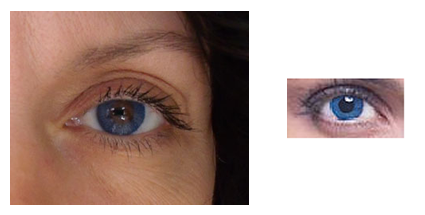 Depending on the brand, some grey contacts appear more of an arctic blue hue while others have almost a pale heather shade of grey with a dramatic outer ring. 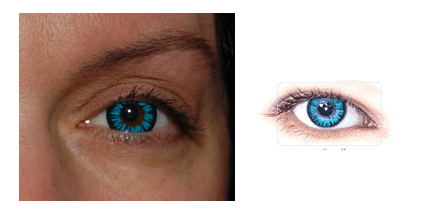 A few images below of different gray contact lenses. Green colored contacts for dark eyes are also very popular and unlike other contact lens colors. You will find they blend better with brown eyes. If you have green undertones or green flecks in your eyes, then you’ll find green contacts look even better. Note: of the three choices below, Freshlook Colorblends green offers the most natural look. Triple Color Green has a dramatic, dark outer rings that make your eyes pop. Hazel and honey colored contact lenses often help to lighten brown eyes to warm shade of dark gold. Twilight vampire fans looking to recreate the dramatic honey-golden hues of their favorite characters should consider the tri-hued hazel contacts for dark eyes available from Turtle Contacts. Freshlook Colorblends Pure Honey and Acuvue Colours Warm Honey are also good bets. Get ready for your motion picture close-ups! Even with the best colored contacts for dark eyes, it can be tricky to achieve a realistic effect when attempting to alter the natural color of your eye. Tricky, but not impossible. The key is to match the right product with your skin tone and natural eye color. Cosmetics like eye shadow or mascara can enhance the look which also causes it to appear more natural. The biggest mistake people with colored contacts make when applying cosmetics is using the same shades they’d use normally, for bringing out their natural eye color. It’s important to consider what color eye shadow goes best with your new colored contacts for dark eyes. Then decide if you’re going out during the day or at night. If your new eye color is forest green then eye shadow in that same hue will create a monochromatic effect. Meanwhile, contrasting shades like rust and rose result in a dramatic look that enhances your new eye color. Just because a certain contact lens looks good on your best friend or favorite celebrity doesn’t guarantee you the same results. It’s amazing how two individual people can wear the exact same product and achieve two dramatically different looks. It might take some experimenting with various brands and colors before you find just the right color contacts for dark eyes but once you do, it’s totally worth it. While the manufacturer’s color charts are realistic, they should be considered as a guide only. In addition to the natural eye color and skin tone of the model, the color settings on your computer, tablet, or other device for browsing the web might have an effect on how the lens appears here versus in real life. You can also check out AC Lens for reviews and customer feedback on various lenses before you purchase. For example, below is my eye with the color chart image of the contact. I have brown eyes. Because colored and cosmetic contact lenses are described by the United States Food and Drug Administration as a medical device, a prescription is required for purchase. Even if you live outside the United States, we strongly suggest you obtain a prescription before buying contact lenses. An optometrist or ophthalmologist is necessary to ensure a proper fit. Wearing contacts that are the wrong size can cause infections, scratched corneas, and other forms of vision impairment. In addition to ensuring a proper fit, an eye doctor can help decide other things as well, such as whether disposable or vial lenses are best. The Fairness to Contact Lens Consumers Act requires eye care professionals in the United States provide patients with a copy of their prescription for contact lenses immediately after they’ve been fitted for them. This allows consumers the freedom to select their own manufacturer when buying contact lenses. Whether they’re for the purpose of correcting impaired vision or will be used as a cosmetic enhancement. Getting a prescription is far less hassle than trying to figure out which shade of contacts to pick out to go with that new shirt or the highlights in your hair. But the prescription does little good if you don’t know how to read it. Here are things typically included on a contact lens prescription and what each thing means. In addition to the measurements of your eye, it has readings for conditions like astigmatism correction as well as bi-or multi-focal lenses. If you aren’t sure about something on your contact lens prescription, it’s best to ask your eye care professional. Colored Contacts for Dark Eyes – Affordable or Expensive? While the cost of color contact lenses can be significantly higher than clear ones. Sites like AC Lens has great deals and exclusive offers to offset those prices. It’s worth the wait to find just the right lenses, even if it means going through life with your original eye color for a few extra days or weeks. It’s more important that your contact lenses are safe to wear, and you can’t put a price on that. Where Can You Get the Best Price? To be honest, contact lens deals on the internet are a dime a dozen. Most reputable online retailers offer monthly deals, coupons and free shipping offers. For example here’s our coupon code from AC Lens. To save $5 off any contact lens order at over $50 enter coupon code “COLORME5” in the instructions section on our order form. Our best tip for buying colored contact lenses online is to never pay the regular price. Wait for a sale, use a coupon or buy in quantity to get a discount. We recommend AC Lens for brand name lenses like Air Optics Colors, Freshlook Colorblends and Freshlook Colors. I have dark brown eyes that sometimes range from a reddish mahogany color to a green/brown color. I want to cosplay Soul Eaters’s Death the kid, so I need gold contacts. Is there a specific brand I should investigate? For your Death the Kid costume I think you can go with yellow or gold colored contacts. I looked at a few pictures and his eyes look more yellow than gold. I recommend you look at the Angelic Yellow or Fire contacts on this site page: https://www.colormecontacts.com/crazy-halloween-eyes/ If you want to stick with gold color, you could look at the Golden Twilight lenses on the same page. My favorite is the Angelic Yellow. Have fun at your cosplay event. I was at the NorthWest Fan Fest a few weeks ago and there was some pretty amazing costumes. I have dark brown eyes. Will hazel look good on my eyes? Will the greenish color appear? Because I’ve seen a lot of people with brown eyes who wear hazel lens and all I see is yellowish brown. For brown eyes the best colors for contacts are green, blue and grey. I also think amber or hazel look nice. But it does depend on your preferences. It’s too bad that you can try on contacts like clothes and see what looks best. You have beautiful collection of colored contacts. How to determine if the lens is inside out. Here’s a few quick tests to tell if your contacts are inside out. A simple way is to look at your contacts from the side. If they are inside out they will look like a small plate or saucer. If they are correct they will look like a cup. Hold the contact between your thumb and finger and squeeze it gently. If the edge turns out slightly the contact is inside out. If the edge turns inwards then it is correct. The final test is to put them in and wear them. If they hurt or are uncomfortable then they are most likely inside out. Flip them around and they should be fine. If they still hurt make sure they are properly cleaned. Dirty contacts can hurt your eyes or worse. If they still hurt visit your eye doctor and get your eyes examined. Make sure you bring the contacts with you so they can have a look. BYW I tried on some old Acuvue2 lenses and they are so comfortably that I hardly know they are in. The color is fair, but my vision is exceptional. I can’t believe my vision. I can see every blade of grass and every leave on the trees. The color is either E-BLU or E-AQU. Ehh on the color, bit vision and comfort UNBELIEVABLE! I feel for the person who doesn’t know if the lens is inside out. Golly. I have been wearing lenses for so many years – hard and soft. Soft lenses are easy to tell if they are inside out. Hold the lens atop of your thumb and forefinger and hold up to the light. It is very easy to see if the lens is cupped with the edges curved inward as opposed to the lens with the edge flared outward. Try it both ways. You will know immediately if the lens is in your eye incorrectly. It hurts like all get out! You would not be able to stand out for long. I have medium brown/hazel eyes, but I want light/pale blue for a cosplay I’m planning. Is there an option that would look natural? My eyes are dark brown and I purchased hazel eye contacts just to make them a natural looking lighter color, although my eyes turned out green. I was okay with the color but this time I want to find the right color to make them look a light shade of brown or maybe blue but look as natural as possible, any tips or advice ? I have black colour eyes. Which coloured lens suits best? I chose brown just a while a ago but im not satisfied. Can you please guide me. Dear I am a 30 year old guy with tan skin and bright gray hair. My eyes are dark brown. I really like to set my contacts with my hair colour but I don’t want to spend my money and find out that the contacts are not even close to what I expected .I have visited solotica and have seen amazing picture but not sure if the contacts work the same.jut help me decide.plz. Cannot say for sure if Solotica are best for you or not. You need to start with your prescription. Once you know that, you can find lenses that both have the fit you need and the color. Freshlook Colorblends Gray is one of the most popular and natural on dark eyes (Sterling Gray is quite dramatic). I would start there and ask the eye Doc for a sample lens to try. I want to be an giant owl and have really dark brown eyes. What brand/color should I get? I really only need 1 or 2 pair. Will I need two boxes for the right and then the left? Lastly, it would be great to get a sample pack of color before commiting to too many. Any of the Circle lenses are your best bet. AC Lens as well as some other online retailers carry these. Do you have any recommendations for purple lenses for brown eyes? The problem with color contacts, is that one can tell a person is wearing them, because the real human cornea will adjust to light or lack of light. When a person is wearing color contacts, the size of the cornea lens of the color contact always remains small. This is how one can always tell someone is wearing color contacts. Maybe one day that will be fixed, and color contacts will not look unrealistic. Yes, agreed there will always be an element of artificial. But they can still be fun accessories! May not get as dark as you want tho. the best colored contact lenses for dark eyes are the Solotica !!!!! omg, specially the natural color, omg ! the best !!!! Thanks for the feedback! Yes they are lovely! From Brazil! Have you had difficulty ordering them?